The Poly DYKDDDDK (FLAG) Peptide lyophilized powder was synthesized by 23 amino acid residues with molecular weight 2,864 Da. The Asp-Tyr-Lys-Xaa-Xaa-Asp motif is repeated three times in the peptide. Eight amino acids at the C-terminus make up the classic FLAG sequence (Asp-Tyr-Lys-Asp-Asp-Asp-Asp-Lys). (Recommended working concentration is 200-400 μg/mL for elute FLAG fusion proteins from the Anti-DYKDDDDK (FLAG) beads. For use in competitive elution of DYKDDDDK (FLAG) fusion proteins from the ANTI-FLAGmonoclonal antibody in solution or bound to agarose on the Anti-DYKDDDDK (FLAG) beads. 3. This product is for R&D use only, not for drug, household, or other uses. Please consult the Material Safety Data Sheet for information regarding hazards and safe handling practices. 1. Thoroughly suspend the Anti-Flag Affinity Gel in the vial, for a uniform suspension of the resin. 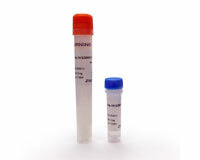 Quickly transfer 10μl of the gel suspension (about 5μl of packed gel volume) to a fresh tube. 2. Add 0.6 mL TBS. Thoroughly suspend the Anti-Flag Affinity Gel by pipetting. Centrifuge the resin at 5000 rpm for 30 secondsand carefully remove the supernatant. Be sure to remove all of the wash buffer without discarding the resin. Repeat 3-4 times. 6. Wash the resin with 0.5mL TBS until the OD280 of the supernatant reads＜0.05. 7. Elution of DYKDDDDK (FLAG) Fusion Protein by Competition with Poly DYKDDDDK (FLAG) Peptide. Elute the bound DYKDDDDK(FLAG) Fusion Proteinby competitive elution with five one-column volume aliquots of a solution containing 200-400 ug/mL Poly DYKDDDDK(FLAG) Peptide in TBS. Poly DYKDDDDK(FLAG) Peptidemay not elute all of the DYKDDDDK(FLAG) Fusion Protein bound to Anti-DYKDDDDK(FLAG) beads. It is recommended the Anti-DYKDDDDK(FLAG) beads be regenerated immediately after use by washing with three 5 mL aliquots of 0.1 M glycine HCl, pH 3.5. The gel should be immediately re-equilibrated in TBS until the effluent is at neutral pH. Note: Do not leave the Anti-DYKDDDDK(FLAG) beads in glycine HCl for longer than 20 minutes. Wash the Anti-DYKDDDDK(FLAG) beads three times with 5 mL of 50% glycerol with 10mM sodium phosphate, 150 mM sodium chloride, pH 7.4, containing 0.02% (w/v) sodium azide. then add another 5 mL of 50% glycerol with 10 mM sodium phosphate, 150 mM sodium chloride, pH 7.4, containing 0.02% (w/v) sodium azideand store at -20°C without draining. Store the product at 2-8°C.